Go make this no-noodle sausage goulash — it is super! It has ground beef, Italian pork sausage and homemade tomato sauce with Italian spices. I served it over roasted green beans, but you can eat it over whatever you like. Anyway, it has been such a fun and productive morning! I got up at 6 a.m. with Jesse and headed to the gym with him. He had to teach class this morning and I decided to take his class since I was meeting a client at 7:30 anyway (my internship project client). It was a great workout and a deadlift day, which I was excited about. Afterward, I had a short 30-minute session with my client and then when I was done, Jesse asked if I wanted to wait for the next class to finish and go out to breakfast with him. Um, yes! There was no hesitation on my end. I love, LOVE going out for breakfast and we went to our favorite place too – Besaw’s. 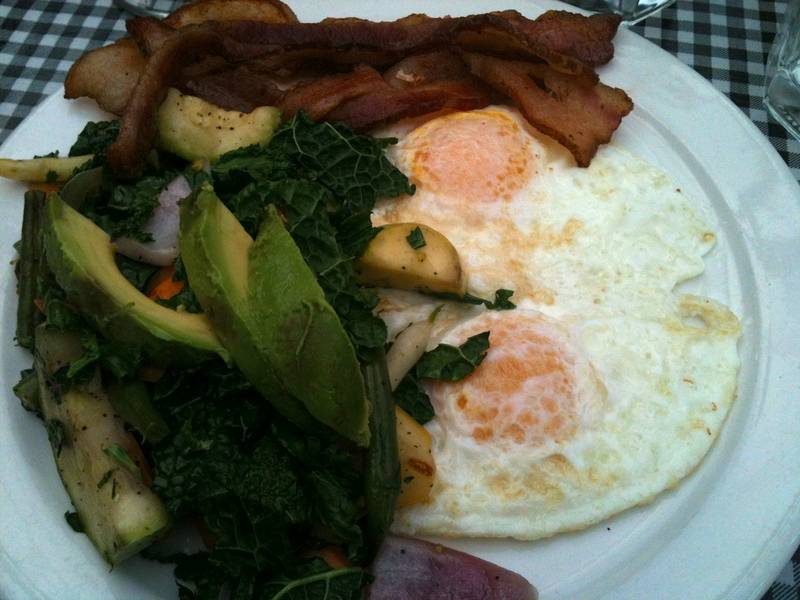 Here’s my breakfast at Besaw’s: over easy eggs, seasonal vegetables, bacon and avocado. I dropped Jesse back off at the gym to teach the 10 a.m. class and then drove to Whole Foods to get some food for our day tomorrow and for dinner tonight. Tomorrow, we’re headed up to the Seattle area for an all day Gold Medal Bodies seminar. It’ll be a quick trip and full day because we’re not spending the night, so need to leave super early. The seminar goes until 5 p.m. or so and afterward, we plan to head back home and grab a bite to eat somewhere along the way. We’ll probably just eat somewhere in Seattle because there will be more options. Plus, we haven’t been to Seattle in well over a year, so it’ll be fun to hang out, even if it’s only for dinner. The workshop should be fun and useful, but also a bit tiring. We’ll be doing parallette work, gymnastics skills (rings, tumbling, handstands, etc. ), hand balancing and more. Good stuff and I’m looking forward to the opportunity. It’s really cool to do this kind of stuff with Jesse too. Heat butter or ghee in a large skillet over medium heat. Once melted, add the onion and garlic. Stir and saute for a couple minutes. Then, add the pork sausage and ground beef. Break up the ground beef with a spatula (and the pork sausage if you choose to remove it from the casing) and continue to cook for several minutes, until meat is browned. Once the meat is nearly cooked through, add the tomatoes, coconut milk, oregano, sea salt and pepper, and cayenne. Stir well and bring to a simmer over medium-low heat. Continue to simmer for about 15-20 minutes, stirring occasionally. Once mixture has thickened up a bit, remove from heat and stir in the fresh parsley and basil. Serve atop vegetable of choice. I recommend roasted green beans, steamed kale or zucchini noodles. I haven’t had dinner yet so this is making me super hungry! I’ve made one thing out of Sarah’s book so far but planning on making the gnocchi on the weekend and plan on adding some chicken and brown butter sage sauce to it 🙂 I’ve made sweet potato gnocchi before but it wasn’t 100% paleo. Hehe, I’m glad it’s appealing! Have fun making the gnocchi — eating it with chicken and brown butter sage sauce sounds fantastic! I’m not sure I’ll be able to try the gnocchi. I could try using butternut squash instead of sweet potato, which would work fine, but I can’t do arrowroot — not a safe starch for me. Ah well. I noticed you use coconut milk in a lot of dishes, do you tend to just mix up a can and keep it in tupperware in the fridge? I feel like whenever I use coconut milk I try to use it all up at once. How long will it last once openeD? If I have any leftover, I store it in a glass jar in the fridge. I don’t store anything in plastic or even own plastic containers! It never sits too long in the fridge because I use coconut milk every single day, so it’s never in there more than 5 days. I’d say to use it up within 3-5 days, but you could maybe go 1 or 2 days longer than that. Also, in addition to buying it in cans (I only buy the Natural Value brand), I also buy small 8.5oz boxes of the Aroy-D coconut milk. These are handy when I only need a little bit and can be stored in the fridge in its original packaging, since it’s a box. Awesome, thanks! The majority of my stuff is glass, especially when I am storing something like this.